Disney novelty phones are a great gift for kids and grown ups of all ages! Novelty accessories are a great way to liven up the dullest room or entertain a small child. Accessories range from animated telephones that sing and dance when a call is received, to adorable Disney animated picture frames and clocks. Whether you are looking for a great gift or to simply add to an existing collection, these popular Disney accessories are perfect! 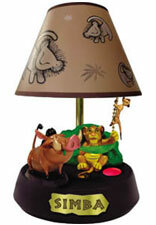 Lion King lamp. Simba pulls the chain to turn the lamp on or off while Pumba fans him, Timon hangs from the chain. Princess revolving lamp. 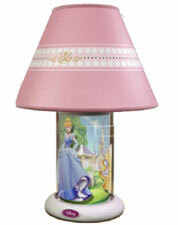 The lamp features revolving animation (characters are not animated) with revolving princess graphics on outer column with castle background theme. Besides, it illuminate rotating lamp turns at all times with option to stop. Disney Fairies Animated Lamp. 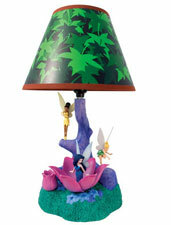 Table or desk lamp featuring Disney Fairies. Features sculptures of Tinker Bell, Iridessa, and Silvermist. Fairies are animated while music plays.